Our latest Distributed Proofreading project is another Mrs. Alex. 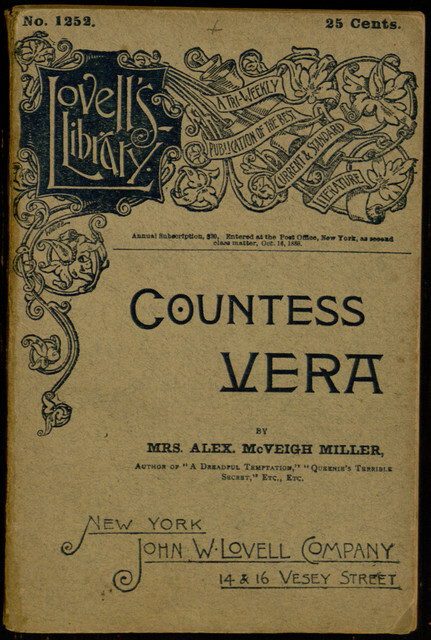 McVeigh Miller novel, Countess Vera; or, The Oath of Vengeance. 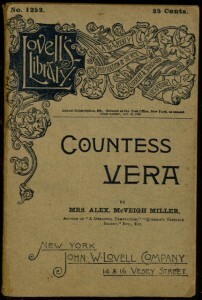 This tale comes from relatively early in Mrs. Miller’s career in melodrama, having first appeared in the New York Family Story Paper in October, 1882. This original publication came hot on the heels of another tale previously released as a Project Gutenberg eBook, The Rose and the Lily. Like that earlier story, Countess Vera is written entirely in the present tense, giving it a somewhat different flavor from most of its contemporaries. To learn more about how you can help create a modern electronic edition of this long-forgotten novel, read this earlier post. When you’re ready to begin work, you can visit the project page to get started!